Export packing is crucial to secure your product for export shipment. Nefab has several types of product and services to make sure that your products reach the end destination without any problems. Export packing solutions are highly affected by the product, transportation mode and the end destination of the product that is being packed. There are several rules and regulations to consider when shipping products internationally. Several countries have restrictions against lumber that has not being heat treated in order to protect against plant pest and diseases. The ISPM15 regulation applies to coniferous softwood and non-coniferous hardwood used as raw wood packaging material. The standard does not apply to wood packaging made wholly of manufactured wood-based products such as plywood and veneer, reconstituted wood products (particle board, chipboard, presswood, oriented strand board, high density fiber board, and medium density fiber board) or products created using glue, heat and pressure or a combination thereof. All packaging material that Nefab use are according to the ISPM 15 regulations, and all solutions has the IPPC-mark to show that they are compliant with the ISPM 15. 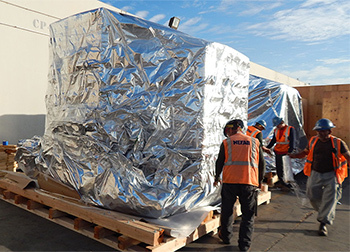 Nefab offer several types of export packing solutions to our customer worldwide. We have products and services that fits all types of transportation modes. We have worldwide network of packaging engineers that optimize solutions for our customers worldwide in several types of packaging materials together with the right inner packaging material to protect your products from moisture, electric discharge, corrosion and shock and vibration.